In order to gain a sense of the size of the exhibition, I had to know about the space. Where is it? How many walls are there? How large are the walls? How is the space used? Things like that. I had been in the building several times, so I had a good idea of the space. But, I had not viewed the space critically for the intended purpose. To fill in the critical gaps, Jean Jackson worked to provide detailed answers to all my questions, providing measurements, providing photographs of the walls, and providing insights on the lighting during various times of the day. 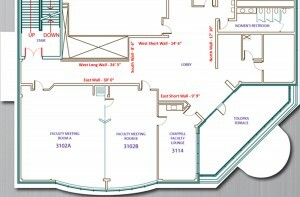 This is the floor plan of the exhibition space. 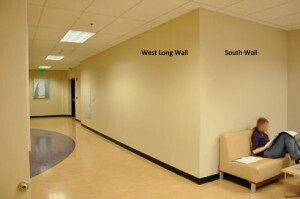 Jean had asked me to consider photographs in the main reception area (the North Wall, South Wall, and the Short West Wall), but included photographs of the long walls in the main corridor. I took that as an invitation to populate those walls, too. Now, it might not look like it, but those are some big walls in a very big space. The next step was to assess about how many photographs each wall might accommodate. 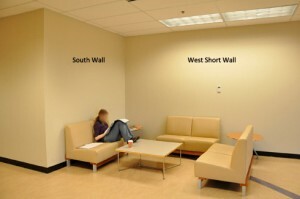 That meant identifying the visual and physical constraints of the walls. One could put images jammed together and really fill the walls. Conversely, one photograph per wall could be done. But, neither of those is aesthetically appealing. 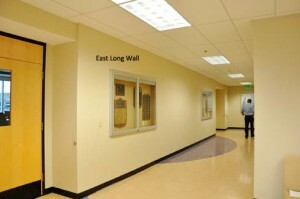 In addition, there are some physical constraints, such as the thermostat in the middle of the West Short Wall and the display cases on the East Long Wall. A print simply can’t be mounted over the device, putting a constraint on where the edge of one frame can be. The display cases, on the other hand, are also visual elements that are there for their own purpose. They needed to be complemented, rather than overwhelmed. An unframed 14×20″ photograph ends up being about 20×26″ when matted and framed. Typically, each photograph would have about 10 to 18 inches between them, depending upon the orientation and the number on the wall. At this point, it was necessary to craft mockups of each of the walls. I took the photos that Jean had sent, and warped them with Photoshop into scale mockups at 10 pixels per inch. The mockups included markups of the baseboards, cutouts of the electrical outlets, the Fire Exit sign, and were set to reflect the exact height and length. 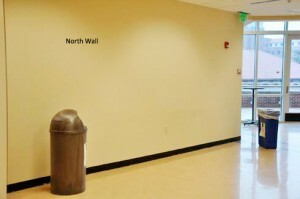 Each also had a mockup of the wall color. Next was to create markups of the photographs themselves. Each of the potential images was scaled to mimic a roughly 16×20” print and ‘framed’ with a white matte and black frame. There were dozens of them. 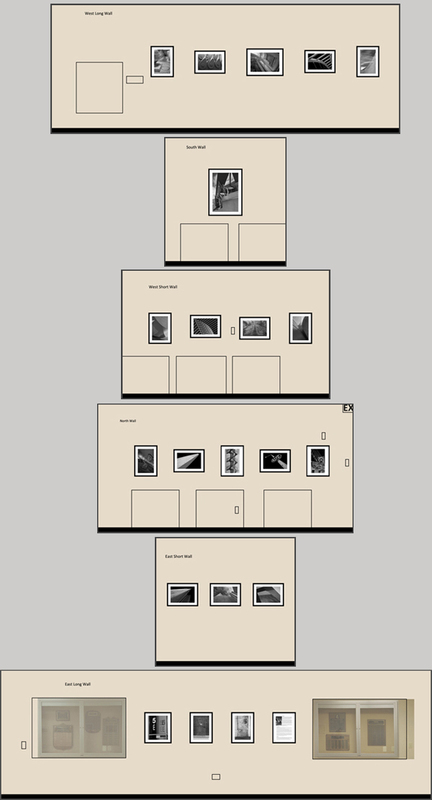 Together, these allowed me to electronically and rapidly select from the images, place them on the walls, move them around, and get a sense of how the exhibition would look and feel. For the Photoshop experts out there, each of the elements is on a separate layer so they can be moved, copied from one ‘wall’ or another, and can be positioned easily. After a lot of experimenting, here’s what the walls looked like in mockup. Spending time considering the space was well worth the investment.